When it comes to buying an AR 15 rifle scope, you have over a thousand options to choose from, making picking the best one a bit overwhelming. In our review of the best AR 15 scope, we give you the different options available and what you should know before making a purchase. Before looking at the different available scope options, you must consider how you’ll use the scope. If using your AR-15 for hunting in a humid environment, a scope with an anti-fog feature is best. Other uses like home defense, competition shooting, or big-game hunting need an entirely different set of features, so it’s important you take your time considering each of the intended uses. As we mentioned earlier, the first consideration before looking for the best AR-15 scope is how you plan to use it. Each of the above uses requires different optic features, so it’s important to take into consideration, every use you plan for your new AR-15 sight. When choosing the best AR-15 scope, you’ll find dozens of different options on the market, possibly more scope options than there are AR rifles out there. Once you decide how you plan to use your AR-15, your next step is narrowing down the optic requirements. 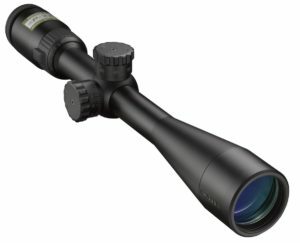 Your first decision for choosing a scope is magnification or no magnification with most shooters not only choosing magnification but usually choosing too much magnification. Most people usually don’t need the amount of magnification they choose in an optical. You want the scopes you look at compatible with your rifle. You want a scope that is right for you. You don’t want a laser scope if you don’t use that feature and an illuminated scope better suits you. For the best performance, look for a scope that matches the rifle and the bullets. Matching the scope with the rifle and bullets gives you pinpoint accuracy involving no or few adjustments. Read reviews, both the bad and good ones, so you are aware of any possible issues. Look for scopes with manufacturer warranties. Most top optical companies offer lifetime warranties that offer scope replacement for defects or accidents. If you don’t know what scope you need, talk to someone that owns different scopes, or a regular at the local firing range or gun club. These people can point you in the right direction when it comes to choosing what features you need. There are so many different brands and models to choose from when looking for the best AR 15 scope, that it is sometimes overwhelming. Here are our choices for what we consider well suited to use with an AR-15 rifle. Originally built for the sportsman, the Aimpoint Carbine Optic ACO sight comes ready for mounting and shooting, straight from the box. The sight tube, made from 30mm aluminum alloy and the fixed height rugged mount gives the ACO great targeting with iron sights for backup. With 2 MOA red dot and nine settings for brightness, this modern sporting scope gives top speed for target acquisition and all-distance accuracy. ACET technology, exclusive to Aimpoint, gives you a complete year of constantly on use from one DL1/3N battery. The housing is completely waterproof for use in almost every environmental condition you can throw at it. The Aimpoint Carbine Optic ACO Sight has a full line of available accessories and delivers rugged high-quality at entry level pricing. 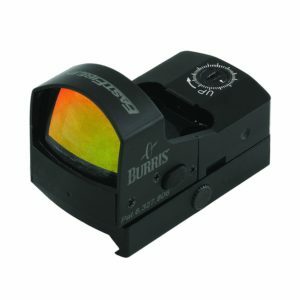 One of the most versatile red dot sights available, the Burris Fastfire II gives fast targeting with great accuracy without sight alignment. Just zero in your target with the red dot and fire. The Fastfire II has three manual brightness levels for adjusting the dot sight with an automatic setting for sensing ambient lighting level, eliminating most washout. You get a parallax-free 1x magnification allowing shooting with both eyes open for enhancing target sighting. The elevation adjustment at 115 MOA and windage adjustment at 86 MOA lets you zero in the sight with a large range of cartridges and calibers. The Fastfire has an F3 mount with enough height for co-witnessing through iron sights when you mount it on a flat top receiver. Round the Fastfire features out with a conveniently placed power button and under mount storage compartment for an extra battery and the Burris is a winner. The Trijicon MRO MOA provides a fast rate of target acquisition on shotguns, carbines, and rifles with a reduction in tube effect. The MRO or Miniature Rifle Optic offers maximized viewing with a tapering light path for better situation alertness and has eight adjustable brightness settings and mid-position offsetting. Adjusters are easy to set, giving a positive-click reticle movement all without specialized operation tools. With multi-coated glass lenses, you get superior light gathering and clarity and no distortion for a crisp, clear dot reticle. The housing, forged in 7075 aircraft-grade aluminum, has a construction that’s fully sealed for protection in even the toughest conditions. The most popular in EOTech’s holographic line, the Model 512 sight gives versatility and speed in close-quarters combat. However, it does not have night vision. With a top-notch sighting system, the model 512 uses some of the most advanced technology in holographic optics. The heads-up display has the holographic pattern, illuminated by a laser light, embedded in the window. The reticle pattern projected on a target plane improves acquisition while increasing shooting environment control for better accuracy. Made with rugged aluminum hood, the Model 512 has a no-tool mounting bolt and an assembly built to last. You can mount the EOTech 512.A65 Tactical Holographic Weapon Sight on a 1-inch Weaver or Picatinny rail. With six daytime brightness settings and six night vision settings, activated by a digitally controlled switch, the Sightmark Ultra Shot M-Spec adapts its sighting in all shooting environments. The housing of magnesium alloy gives excellent durability and gets superior functionality from its 1,000-hour battery life. The Sightmark Ultra Shot has shock-proof framing, protecting it from recoil for .50 caliber. Also, a protective hood for shielding the sight from impact. In addition to its sturdy build, this scope remains water tight, submerged up to 40-feet. It has accurate shooting from 10-yards to infinity, thanks to its dual-pane glass and parallax-corrected lens. The durable UUQ Tactical Holographic Sight has a sturdy build of an aluminum alloy, aircraft grade, and a Picatinny rail. This gives the shooter easy mounting with shotguns or rifles. The reticle has dial adjustable brightness levels with a red and green setting. Also, up to four reticle patterns for more accurate shooting. Adjustments for elevation and windage let you lock into the shot at a distance while a 33mm reflex lens lets you take both normal and rapid-fire shots at a moving target. Nikon’s line of precision rifle optics gets an update with their P-223 with a new magnification. The updated 4-12×40 and a BDC 600 reticle make effective long range targeting for all AR rifles. The P-223 has fully multicoated lenses with two different options for bullet drop compensation. Use the BDC 600 and hash marks for 100 to 600 yards and open circle aiming for compensating long range bullet drop. The second bullet drop compensation comes with using the Rapid Action Turrets. Simply dial in the distance while holding the BDC reticle crosshair on the target. The dial-in method handles distances from 100 to 600 yards for an easy and fast option (when shooting long range targets). What Are the Different Types of AR-15 Scopes? The history of the red dot scope spans several decades with their start in the American sporting field. As their popularity grew, American special forces started buying the red dot as civilians and using them when doing low-light raids. The red dot increased the soldier’s effectiveness when shooting, thus saving countless lives. With continuing advancements in technology, the U.S. military extensively uses the red dot scopes. If your preferences lean toward home defense, high quality doesn’t come cheap. However, you can still get reasonably priced quality red dot scopes. The reflective set-up projects a red dot on the target, allowing a quick and accurate shot. Since a reflex sight doesn’t use a laser, it has little light emitted in front of the shooter. Many red dot scopes come in the reflective category with their objective lens and partial mirror coating. Red dot scopes are a short or medium range optic without magnification or a small magnification of 1.7x or less. This low magnification lets you shoot with both eyes open for better performance in tactical situations or simulations. The red dot sights have a simple design with concave lenses and metallic coating for reflecting red light. The reticle dot projected on the target is a reflection from the light diode on the scope inside the tube. 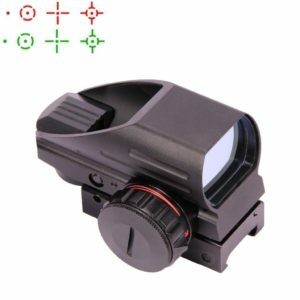 Because of its reflective coating, the red dot scope has less light transmitted through its objective lens than what get transmitted through clear lenses. But, most shooters don’t notice the difference since the coating only reflects light wavelength emitted by a LED reticle projection. Other reflex scopes use an ambient light gathered from a system of fiber-optics or tritium beta lamps for use in situations with low light. Red dot sights can also utilize electronics for faster targeting and easier use under varied light conditions while giving a natural target view. The electronic sights are meant for high speeds at close and medium range, perfect for sighting moving targets. Electronic rifle scopes are more desirable for use in self-defense, competition, law enforcement, military training, and hunting. 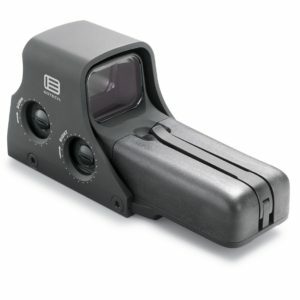 Usually, electronic sights don’t have any optical magnification, except for a few 2x versions currently on the market. Our favorite AR-15 scopes for self-defense are red dot scopes, particularly the Aimpoint ACO, which is at the top of or review list. With their fast target acquisition, red dot lens usage leans toward defense or tactical and combat simulation competition. The holographic scopes use laser transmission holograms to superimpose the sighting reticle on your target view. This process uses a laser light application to photograph the reticle. By sandwiching the hologram in glass, you get a window to view the target via the laser illuminating the hologram contained inside the objective lens and not on it. The process does away with the need of reflective objective lens coating. Currently, holographic sights are only available in heads-up style. Most shooters prefer sights of the over tube-body style which are lightweight and less bulky. Additionally, you get a significantly wider objective lens for larger field view than the round, tube body sights. Since the reticle is a hologram, they have the possibility of being any shape or size, but EOTech added industry’s smallest, 1 MOA dot with a circle of 68 MOA. This combination offers very quick acquisition of the target and gives better long-range precision than the 2 or 4 MOA dots found in reflex sights. A 1 MOA dot, at a 200-yard distance, obstructs two inches of a target. With a 2 or 4 MOA dot, the obstruction grows to four to eight inches of a target. 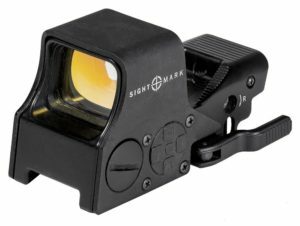 By combining a holographic sight and an additional 3x magnifier, you get an enlarged target with the dot remaining at the same size. If you add a magnifier to the reflex sight, you get both an enlarged target and dot. If your usage leans more towards long-range target shooting or hunting, then a standard AR sight with minimal or moderate magnification is the better choice. There are two magnification options when choosing the best AR 15 scope, fixed and variable magnification. Magnification is an important consideration when choosing an AR-15 scope and depends on the planned use. Scopes with fixed magnification lace moving parts for decreasing and increasing magnification. This makes them sturdier and more reliable over their variable scope counterparts. The minimum to moderate rates of magnification makes them preferable to scopes with variable power when using them for tactical or defensive use. A scope with variable power gives the shooter time for magnification adjustments for matching the target range and makes them preferable for long range shooting. The biggest disadvantage to using scopes with variable power is their weight, making them heavier to use than a scope with fixed power. With a weight of 14 to 18-ounces plus a 3 to 10-ounce scope mount, you have a significant amount of weight added to the AR-15. This defeats the purpose of the compact rifle’s light weight. Another consideration when looking at variable power scopes is FFP or Front Focal Plane and SFP or Second Focal Plane. The FFP and SFP determine the magnification level. With a Front Focal Plane, the reticle size decreases and increases when magnification decreases and increases making it consistent with target size. If you have an SFP reticle, the size of the reticle stays the same whether magnification is decreased or increased. It remains the same size regardless of target size. An FFP reticle scope comes at a much higher price than an SFP reticle. Unless you plan on long-range shooting where you need the increased magnification to find the target, you may find the added expense of an FFP scope unnecessary. Objective lens size is another factor for consideration when buying an AR-15 rifle scope. Looking at the tube and exit pupil diameter size, the larger the diameter size of the exit pupil and tube on large objective lenses, the greater the light they gather and transmit to the eye. This provides a clearer sight under low lighting conditions. Also, take into consideration the eyepiece diameter and the eye relief length. While the objective lens size determines the amount of light, the eye relief helps you acquire your target quickly. Also, determining the closeness of your eye to the eyepiece for maximum field view. With the number of reticle types available, you must consider whether you need long-range or close-range. Duplex, dot, and post reticles are simple and work best for quick target acquisition at close range. Milliradian and mildot are reticles for range finding and have complicated use. Bullet Drop Compensated or BDC reticles have a huge learning curve with their complicated displays. When it comes to choosing a rifle scope you have two choices of turrets, tactical style, and capped turrets. There are important differences between the two styles of turrets. The high profile of the tactical turret makes adjusting the reticle position very easy. The capped turrets, with their low profile, take longer to adjust the reticle position for compensation of elevation and wind. Close-range shooters prefer the capped turrets with their low profile, while long-range shooters prefer the quick adjustment advantages of tactical turrets. When it comes to choosing accessories for your AR-15 rifle, nothing is easy. There are many options for AR-15 optics, and it takes a lot of research to find the best one. Hopefully, we’ve narrowed it down enough so you can decide which is the best AR-15 rifle scope for you.